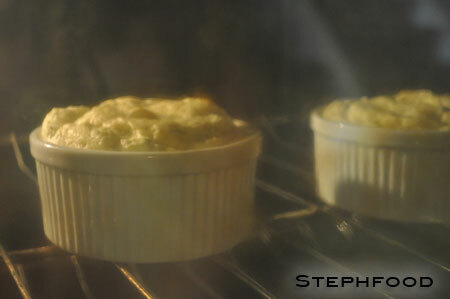 I’ve never made a soufflé before. I knew it was something eggy, but I’m not really sure I had a concept of what one was. I just knew that they fell, and were complicated. I never ate one, I never tried to make one. As a kid, my favourite birthday meal was home made lasagna and Black Forest cake. My girlfriend, on the other hand, loved cheese soufflé. I thought that was the funniest thing – what kid asks for cheese soufflé? 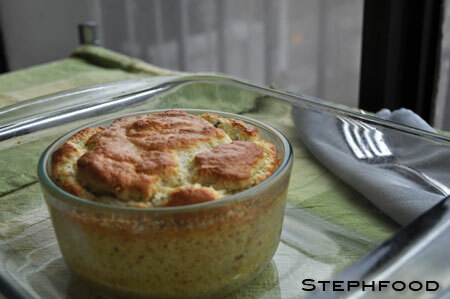 Maybe it was just because I thought of soufflé as a snobby food, and not kid food. Obviously, different families eat different things. So, yes, this is a great challenge for me. If you’ve never eaten something before, how do you know if you’ve made it right?? It’s hard to describe the texture… outside was a little bit crispy and nice, and inside was fluffy and soft. It’s almost like crossing scrambled eggs, a milkshake and crème brulée. Maybe. Blog-checking lines: Dave and Linda from Monkeyshines in the Kitchen chose Soufflés as our November 2010 Daring Cooks’ Challenge! Dave and Linda provided two of their own delicious recipes plus a sinfully decadent chocolate soufflé recipe adapted from Gordon Ramsay’s recipe found at the BBC Good Food website. Time for my third Daring Cooks challenge!! This month’s challenge was exactly what I had been looking for…. yummy Mexican food! Toronto doesn’t have many great Mexican restaurants, unfortunately. There are a couple… and we had one that I really liked that closed a couple of years ago. Booo! The challenge recipe was for chicken enchiladas, and of course I had to modify the recipe and swap out the chicken. I chose to make crab enchiladas instead, after a dish that I had in California and haven’t had since. These were not going to be “crab” enchiladas, but contain nice chunks of King crab. I bought some crab legs, pulled out the meat for the enchiladas and used the shells to make the broth. The enchilada sauce was really simple to make, but required some items that I couldn’t find in the grocery store. I ventured out to Kensington Market, where Mexican shops carry almost everything a silly Canadian girl could want… except for the Anaheim chiles. It’s ok – I got Poblanos instead. 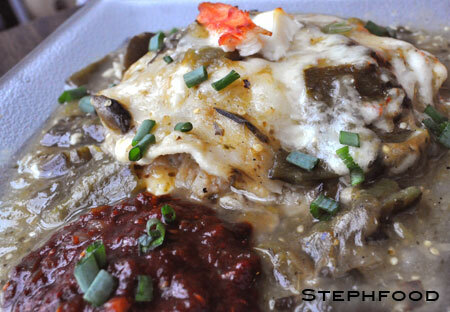 I think I secretly wanted to have to get Poblanos, after watching a show on Chile Rellenos. (I think that might be my next Mexican challenge! Yumyum!). I also got a hand full of lovely green tomatillos. These are so nice to look at (and photograph), and have a crazy tartness that you can’t get from a red tomato. The peppers and tomatillos were roasted in the oven first, the peppers were skinned and seeded and all of the ingredients were blended together. Realizing how simple this was, I adapted this process to make my ancho salsa. I roasted some red tomatoes and onions, and soaked and de-seeded some dried ancho peppers. I blended it all (pulsing, rather than pureeing… I wanted to keep some of the texture). I added a touch of ground chipotle pepper at the end, for some smokiness. SOOOO GOOOD! Another “secret ingredient” was some crumbled queso fresco… it doesn’t melt like other cheeses, so I used a few different cheeses in this dish. Queso fresco is a fresh cheese, like Indian Paneer, so it has a bit of a grit and chew to it that is unlike other kinds of cheeses. I think this cheese is the reason you see feta sprinkled on Mexican dishes sometimes… feta is one of the closest common cheeses, when comparing flavour (saltiness) and melting properties. 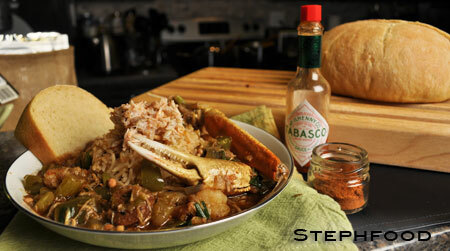 This dish did take some time to make, considering the broth, roasting of peppers, assembly and baking. It would be considerably less time if I did some of these things in advance… so really not a bad dish to make when you’re having company over! We thought it looked – and tasted – really impressive. Hm, I even think I managed to make this one totally Gluten Free! 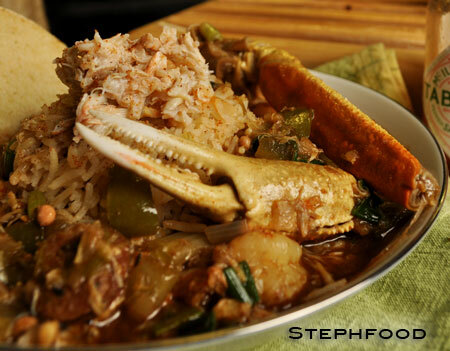 You could also make this vegetarian by substituting the seafood stock for veg, and the crab meat for either some faux meat, or some nice roasted vegetables. Maybe even beans? 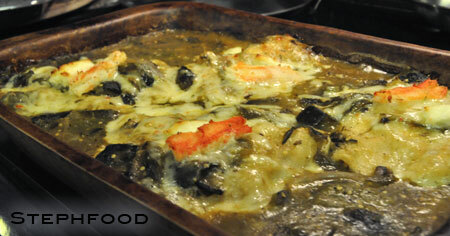 Four crab enchiladas – fresh out of the oven! 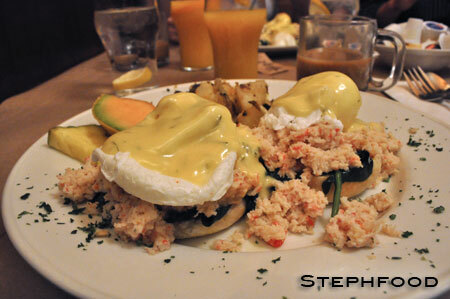 Crab – I’m not sure how you get crab where you live, but I started with frozen pre-steamed crab legs. If you get them fresh, you’ll want to cook them first. If you can’t get whole legs, feel free to use lump crab or canned. If you get the pre-cooked frozen crab, I would advise against steaming the legs whole – just thaw, pull crab meat out, so the only cooking will happen in the oven when assembled in the enchilada. You don’t want overcooked crab. Frozen Veggie bits – If you read my blog regularly, you probably saw a post about this a week or so ago. If not, ‘frozen veggie bits’ is a bag of bits that I cut off of my vegetables when preparing them for dinner and then freeze for use in stocks. These are not rotten vegetable parts, but maybe a little drier bits, or stems, or the bits that you might not want to include in the dish. For me, this includes herb stems, mushroom stems, broccoli stalks, bits of pepper that are close to the membrane or stem, carrot peels, etc. etc. Heat the oil/butter in a stock pot over medium heat , until it has coated the bottom. Sauté the onion and garlic for about 5 minutes, stirring occasionally, until the onion is soft and golden. You’ll be able to smell when it is ready. Add the veg bits, shrimp and crab shells, and sauté for another 5 minutes, stirring occasionally. Add the bay leaf, peppercorns and water. Bring to a boil. Turn the heat down to low and simmer for about 1 hour. 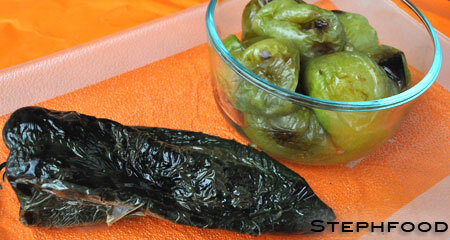 1½ pounds Poblano chiles (about 6 medium) – roast, peel, remove seeds, chop coarsely. Coat each chile and tomatillo with a little vegetable oil. Lay them on the grill or baking sheet (line pan with foil for simpler clean-up). Place the grill or broil close to the element, turning the chiles so they char evenly. They should be black and blistered. As they are completely charred (they will probably not all be done at once), remove the chilis to one bowl and the tomatillos to a second bowl and cover with plastic. Let them rest until they are cool. Put the tomatillos aside for now. To de-seed the chiles, pull on the stem and the seed core MAY pop out (it rarely does for me). Open the chile and remove the seeds. Turn the chile skin side up and with a paring knife, scrape away the skin. Sometimes it just pulls right off, sometimes you really have to scrape it. 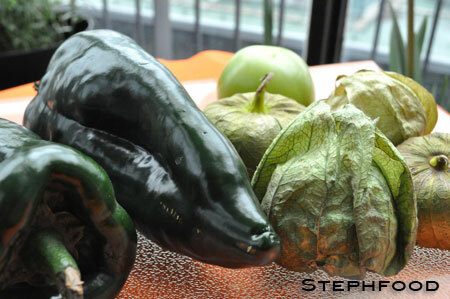 Take the roasted tomatillos and puree in a blender or food processor. Put the puréed tomatillos in a saucepan along with the broth, chopped and roasted green chiles, minced onion, oregano, garlic, salt and pepper. Divide half the crab meat among the first layer of tortillas, top with another ½ cup of sauce and 1/3 of the grated cheese. Stack another four tortillas, top with the rest of the crab meat, more sauce and another third of the cheese.